Another great vegan awareness fair organized by Melissa who did a great job for this, the first vegan fair she has set up. 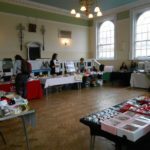 We had a great space for our stall in one of the 2 halls inside the building. 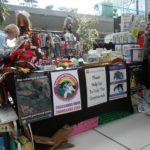 Again so nice to see such a great variety of cruelty free/animal rights campaign stalls and to be in the company of so many like minded people. 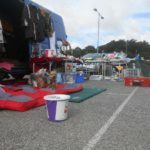 Our merchandise and tombola were very popular and we received a lot of very generous donations in our collection pots. We had mild dry weather and a great space outside and under the cover of Roys due to the great support of the management. We had overwhelming support from the public with many people who were visiting from other parts of the country for the Winter break at this very popular tourist location. 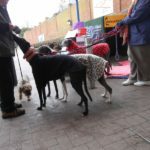 Needless to say our beautiful accompanying greyhounds received lots of attention and admiration. We were also able to promote and sell several calendars and packs of our exclusive Christmas cards. 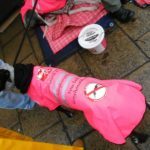 We were lucky enough to have the charity stall and a street collection permit today. A bit drizzly on and off later in the afternoon but still mild. 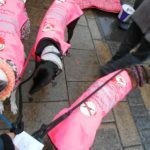 Our beautiful hounds wore their awareness macs so not only were they kept snug but also helped to raise more campaign awareness with the slogans on the macs. Being close to Christmas the City was very busy and our stall had lots of visitors throughout the day, not only did we receive very many generous money donations but sold lots of our hound knitwear and our other merchandise but also some very good quality bric-a-brac and Christmas items which had been generously donated to us to sell. 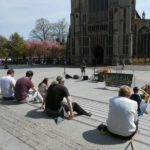 Hundreds of leaflets were distributed today and with many visitors to Norwich from other parts of the country this enabled us to spread our campaign awareness to an even broader audience. 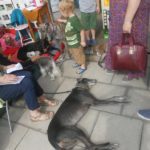 Luckily for the late time in the year we still had a very mild dry day for our event with a great space outside the store to accommodate us with the shelter and our beautiful greyhounds. We are always well supported by the locals at this store as they all look forward to seeing us and hearing of the updates of the campaign as we only have one annual event here in December. 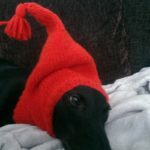 We were also able to promote and sell our calendars and Christmas cards which were very popular and later in the week we received some orders for our sighthound jumpers and head and neck gear. 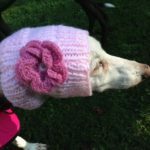 So the amazing ladies who hand knit these beautiful items for us, continued to be kept busy crafting to meet the demand of even more orders. 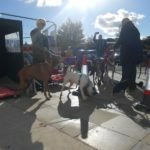 We have been so very lucky this Autumn to have had such dry mild weather for all our awareness events, so our beautiful hounds could accompany us too. 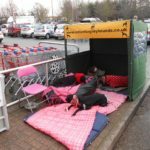 We have to take so many beds, blankets jumpers coats etc as our main priority is to keep them all comfortable during the day. 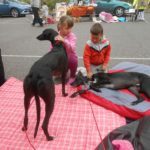 They never miss out on fuss and cuddles and it is good for people to learn what gentle friendly hounds they are, this helps when people may consider fostering or adopting greyhounds and lurchers. 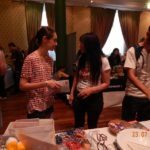 Over the years we have met some wonderful people at such events who have become great foster carers and adopters for AfG. 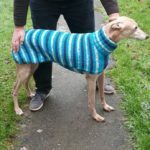 Again our hound knitwear was much in demand with some people buying the hats, scarves,neck bands snoods and jumpers not only for their own hounds but to give as doggy Christmas presents for hounds of friends and family. How lovely that several hounds won’t miss out on special Christmas gifts. Our last event for 2016. 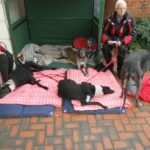 We are always made so very welcome here with our hounds with great support from the management and staff and always have a great space outside to accommodate the awareness station. 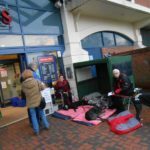 Not only do we receive generous support from Jollyes customers but with this being such a popular and busy shopping estate with a variety of shops we meet and are well supported by customers from the other shops. Just a morning event today as it started to turn chilly by mid day, but we had a very successful morning and a great end to what has been another amazing year of awareness and fundraising. AfG do not hold many awareness events throughout November due to the short days and problems with fireworks etc. 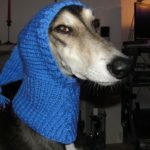 However we were still kept very busy with sales of our 2017 calendars ‘ Sighthound Survivors ‘ and sales of our exclusive Christmas cards and various sighthound knit wear. 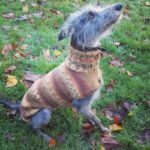 Its lovely to receive photos from all over the country and overseas of the various sighthounds being kept cozy in the AfG knitwear. 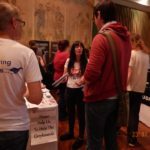 Thank you to Rosemary who organized the AfG stall at this fantastic vegan festival. 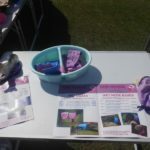 Lots of merchandise sold and a lot of interest in our campaign, with lots of our awareness leaflets taken. 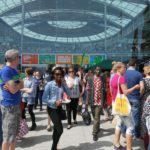 The event had 3,500 members of the public attending, meaning more vital awareness raised to even more people. 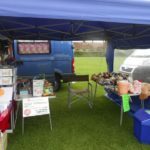 We managed to chose a lovely bright Autumn day for a stall at the only local car boot being held at this time of year, meaning it was heaving with customers. 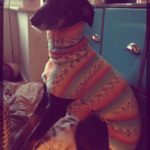 Our doggy knitwear proved very popular today, noticed by more people due to the fact our accompanying hounds were wearing jumpers and head gear. So another opportunity to raise more vital awareness and funds. 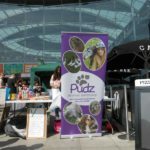 Another fantastic Vegan fair organised by Shena and friends from Pudz Animal Sanctuary, Lincolnshire. 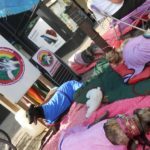 They are organizing several Vegan events across the country now, they do a great job, especially having to look after so many rescued animals too.They support many of the local rescues and animal rights campaigns at their events. 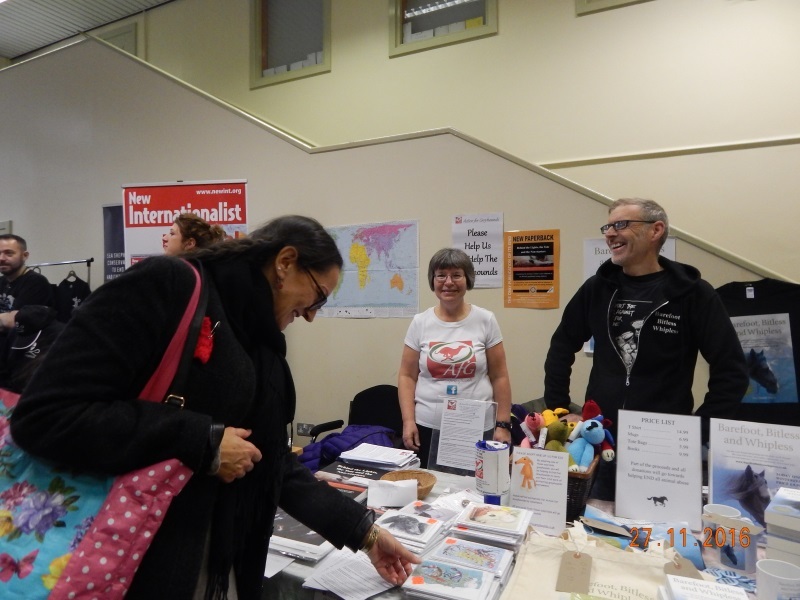 We had a great space for our stall and met various people, some who knew of AfG and some who have not, so even more awareness raised. 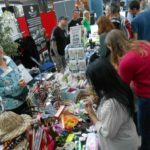 It was lovely to see so many stalls promoting a cruelty free living and raising awareness of so many animal welfare/rights issues, such a great day to spend among so many like-minded people. 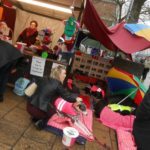 Rosemary and her mum organized another great stall at this event which is growing in popularity with local businesses and other charities. Rosemary and her mum receive donations for the tombola prizes as well as purchasing items themselves. Also AfG merchandise is sold on the stall along with campaign information leaflets and collection pots. Visitors are very supportive of the stall. We had a lovely bright dry weekend for the last of our 4 weekends at the store for this year. 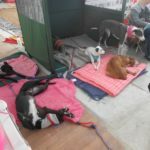 Even with building work being undertaken on the trading estate (luckily not over this weekend) we still had plenty of room to accommodate us with our hounds. 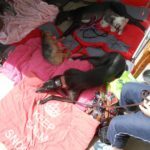 We had a real meet and greet weekend with adopted AfG greyhound Happy paying us a visit with his little housemate Staffy cross Lilo and our little foster greyhound pup Jack joined us on Sunday and enjoyed things so much, he slept for nearly one hour curled up with the other hounds. A lovely Autumn day for our stall before the clocks change and the days start drawing in. 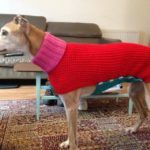 Our sighthound knitwear, 2017 calendars and our exclusive Christmas cards were very popular today. Luckily being very close to Halloween we didn’t hear any daytime fireworks being let off, which is a good thing. 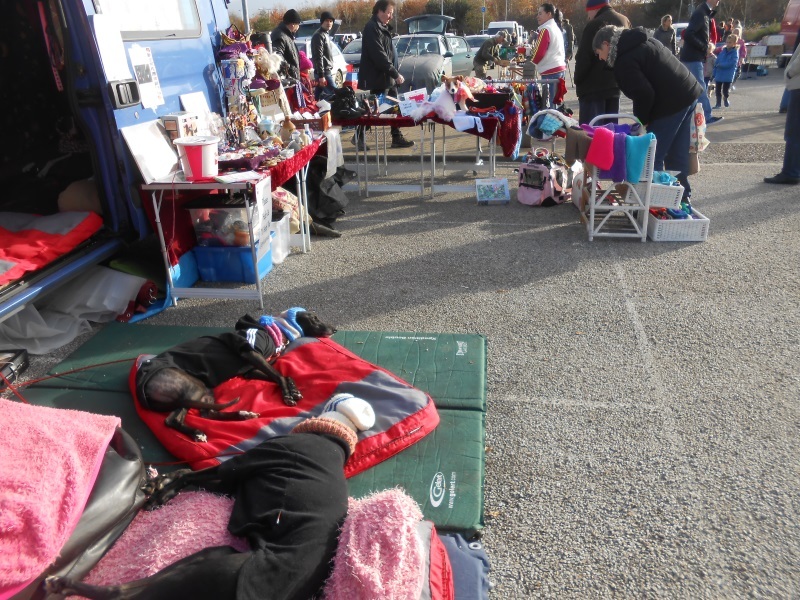 A lovely day for the last Sunday sale for this year at this car boot sale until next April. So a nice warm sunny Autumn day now the clocks have changed and the daylight hours will be getting less. 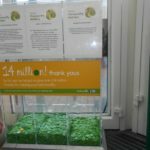 We were very fortunate to have been chosen along with two other local charities/good causes to benefit from the Waitrose Community Matters Scheme, which has been in operation now for over a decade, where the three chosen causes benefit from a share of £1,000.00 from the tokens donated to shoppers at the store who, in turn, donate them to their chosen cause in either of the two token donation stands located at the two entrance/exits of the store. AfG received £285.00 at the end of the October Scheme. AfG were also one of the three causes to benefit from the scheme when it was very first introduced many years ago. 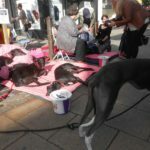 We had a very successful day very well supported by the public and raised vital funds and awareness. 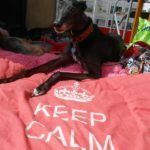 Glorious weather meaning we could be accompanied by many of our beautiful hounds including foster greyhounds Grace and Vincent (aka Vinny). 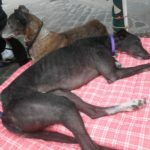 Vinny took a fancy to brindle girl Fran, he spent the day making sure he was next to her. Another lovely weekend at this very busy popular store who AfG are charity partnered with this year. 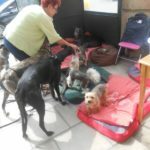 We were joined by several rescued greyhounds as well as 4 other rescued hounds, Zoi a Chinese Crested, Suki a terrier cross, Molly a bearded Collie cross and Litza a small 3 legged cross breed rescued from Greece after a life of abuse. All receiving lots of admiration and attention from the public. Another very busy day in the City centre with lovely weather. 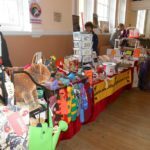 We had lots of lovely items on sale which had been very kindly donated as well as our ever growing unique merchandise and of course we are able to carry on raising awareness having our campaign materials available on the stall. 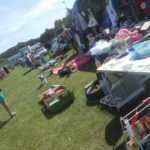 A lovely weekend to get out to some local car boot sales. 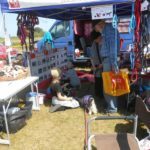 We like to have stalls at various car boot sales across Norfolk and Suffolk as it allows us to meet more people and therefore raise awareness of AfG further afield and as we usually have foster hounds accompanying us people are able to meet them so another opportunity of meeting prospective foster carers and adopters. 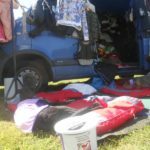 Another car boot stall this weekend at the Sunday sale starting at 10am from Easter until end of October. A lovely clean site on hard standing ground meeting lots of regular local visitors as well as visitors from all over Norfolk and Suffolk. 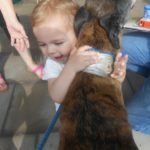 The hounds are always so popular with children and they enjoy the attention with the children stroking them. 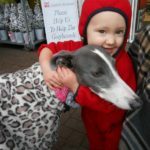 Often parents will leave their children with the hounds while they look round the sale and come back for them later, so the hounds are never short of attention and the children learn about each hound and their individual stories. 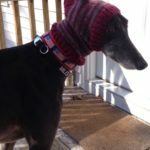 Always good to promote rescuing animals to children as well as the awareness of the exploitation and suffering many greyhounds endure. We were fortunate enough to change our upcoming Saturday event for today, Friday due to the bad weather forecast for tomorrow. 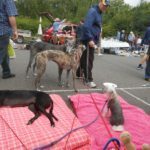 So we had a glorious day accompanied by many hounds including foster greyhound Vince (aka Vinny) now quite used to the events and new foster greyhound Lacey who soon got settled at the event, especially with her being so affectionate and attention seeking, so of course she loved the constant attention she received throughout the day. As usual we had great support from the public. 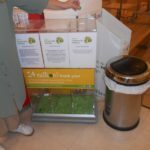 Lisa organized another awareness day with a street collection helped by other AfG supporters. 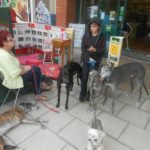 Lisa and the group are becoming well known all over Surrey with their regular awareness events, they always have a lot of regulars coming to speak with them and are always meeting new people especially in the holiday season which is when they have most of their events. They always have great public support wherever they are. 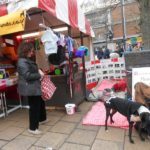 We are getting so well known now with our regular charity stall on the Haymarket in Norwich City Centre. 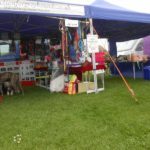 It is now 16 years we have been using the stall. 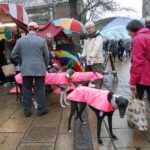 We meet up with regular visitors as well as always meeting new people and many people make a special visit to the stall to make a fuss of our accompanying greyhounds should the weather be nice enough for them to be with us on the stall. 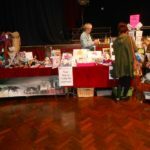 The success of the stall and all the bargains and often unique items we have for sale on the stall is due to the fact that we are fortunate to have some very lovely items donated to us to sell. 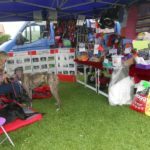 We now have an every growing list of merchandise in stock, mostly our own exclusive sighthound accessories and sighthound themed packs of cards of which most is on sale on our stalls as well as to be purchased from our website. 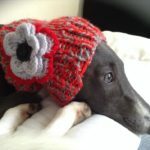 The hounds are often sporting our sighthound clothing so do a great job modeling and promoting it. 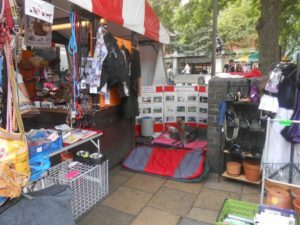 We always have the stall one Saturday per month (weather permitting) and sometimes in the Summer months we occasionally have the stall on a Thursday or a Tuesday. 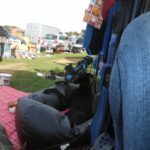 We thought we would try a new car boot sale. 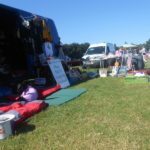 This is one of a new set of car boot sales just starting up hoping to find venues across Norfolk and Suffolk for sites on the coast as well as in the country. This one is located near Aylsham on a Saturday Morning for Spring and Summer and is on a beautiful field adjacent to a very busy garden centre. 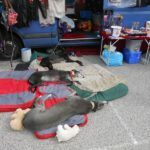 So not only did we have general car boot visitors but many of the garden centre customers came to look round too. In a different area, so we met lots of new people so were able to raise even more awareness about AfG. 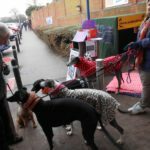 Lots of people spent time paying attention to the hounds and paid them lovely compliments. Many people were walking their dogs round with them too so it was nice to meet such a variety of dogs too. At the end we had a lovely walk around the massive field with the hounds. 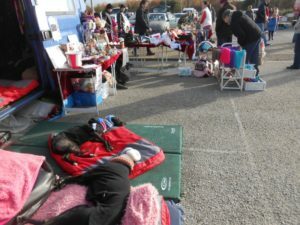 A lovely weather forecast for today so we made the most of it by doing a stall at this very busy popular car boot sale. 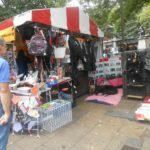 We always find that good weather means more car boot goers attending and spending more time looking at the stalls. We often get people donate to our collection containers if they cant see anything they want to buy. Of course wherever we go we always meet new people as well as regular visitors to our stalls and are always able to issue our information leaflets to people who do not know of us. 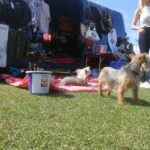 A beautiful day for a car boot sale with the hounds on the Norfolk coast, the car boot is held in the Summer on a Tuesday morning at the Cromer Football Club ground (opposite Cromer Hospital) it is a very popular holiday car boot sale as it has been running for many years. 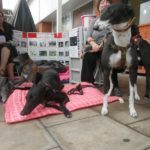 We like to have a stall here at least once a year in the Summer holiday as we know people in the area like to keep in touch and keep up to date with what we are doing and of course, to make a fuss of the hounds who are with us on the day. 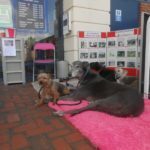 Our greyhounds had 2 little canine pals with them today on the stall and its always nice for people to see that greyhounds and tiny dogs can and do get on well together. 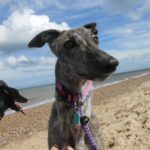 Over the years we have met people at this sale who have become adopters of AfG hounds and they have settled into their great forever homes across the beautiful Norfolk coast. 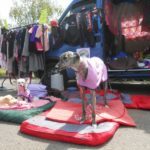 We had our Cool Houndz wet gear on a display table today and have sold several items, people were commenting on what a great idea they were. We had a glorious week for our annual August collection week at Wroxham. 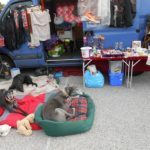 Thanks to the great support of staff and management of Roys we are able to have a great space outside and under the cover of their store to accommodate us and more importantly to keep the hounds who joined us each day, happy and comfortable. 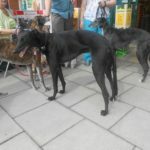 We were joined two of the days for a while by some of our foster hounds who are currently seeking their special forever homes. 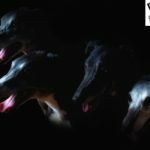 Our 2017 calendar ‘Sighthound Survivors’ is now hot off the press so we launched it this week with the help of the promotion of an article about the calendar in our local newspaper. We sold several copies this week with lovely comments of how beautiful the images are. This year all the photographs were take by a local photographer, Belinda Buxton at her studio in Wymondham, Norfolk. Wroxham is a very popular tourist spot and so we always meet lots of new people from all over the country and some from overseas as well as all the local people. 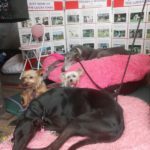 Its nice to hear stories of their rescued sighthounds and other rescued dogs, some of who come along to see us for a sighthound get together. 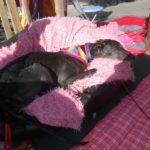 On 17th we were joined by beautiful rescued greyhound Penny who is adopted from a local rescue by one of our supporters. 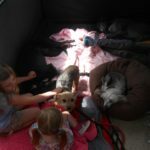 We felt we knew Penny as we had often heard about her and seen photos of her over the years but this is the first time we had all met her and she soon settled herself in with our hounds as if she had always been with them. 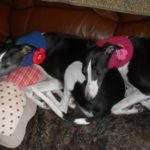 That’s what we call ‘The Sighthound Bond’. 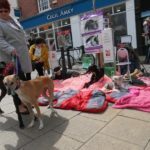 Our last stall for this month in Norwich City centre with beautiful weather meaning the City was very busy and we had lots of visitors to our stall with our accompanying hounds receiving lots of attention. Lots of copies of our new 2017 calendar sold with people meeting two of our hounds who were with us featured on the calendar. For some reason our packs of Christmas cards were very popular today, probably because there were a lot of holiday makers in Norwich who took a liking to the cards. This is good as all our cards have campaign awareness on the back. 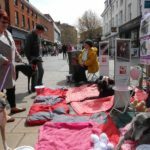 Lisa organized another awareness and fundraising event again in Dorking helped on the day by other AfG supporters. 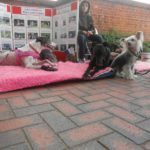 They had a very successful day and managed to issue hundreds of our information leaflets despite it being a drizzly, dull day and not being able to have their usual awareness spot due to road works taking place. Never the less they managed to find a nice dry spot where they could display the awareness posters and the public soon realised they were there. AfG are one of this stores charity partners and this is the first of our four weekends here for 2016. 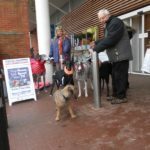 We had amazing weather and a great place outside the store to accommodate us with our beautiful accompanying hounds. 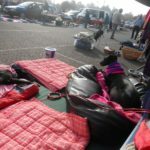 Kiz, little AfG foster greyhound enjoyed her day again today and lapped up the attention she received and on the Sunday we were joined by Rosemary and her family from AfG in Sheffield, who gave up their day from their Norfolk holiday to help with today’s event. 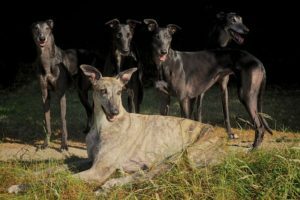 We had the pleasure of having the company of their beautiful rescued greyhound Sean ( affectionately known as Sheffield Sean) he loved being around all the other hounds, most of who he has met before on his visits to Norfolk. 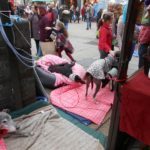 We are always kept busy throughout the weekends here meeting so many people and so many different dogs and of course being able to raise lots of awareness of our cause as well as allowing people to realise just what wonderful hounds greyhounds are. Lisa organized another great awareness day with the help of other AfG supporters. Hundreds of leaflets were issued and great public interest was shown. Afg were fortunate to be invited to have a stall at this event. 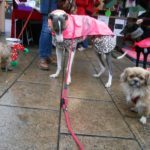 A glorious day meeting lots of new people and lots of happy dogs, many of who were rescues. 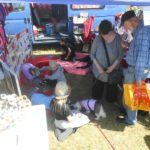 Our cuddly toy an our doggy treats tombolas were, as always, very popular attractions on our stall, next to our beautiful accompanying hounds of course. The bottom of the school field was next to the lovely peaceful beach, so once we had packed away we enjoyed a lovely time with our hounds at the beach. 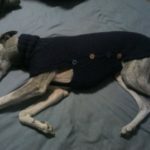 Little foster greyhound Kiz, we expect had never seen a beach or the sea before and was a bit bewildered at first but soon got used to the new experience. Lynsey, who formed AfG Newcastle organized another great awareness stall with the help of Heather. 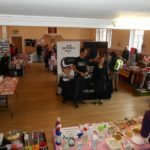 A new venue for Nev Fest (North East Vegan Festivals). 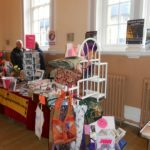 As well as raising lots of awareness of AfG’s campaign and hopefully recruiting new local members for their group lots of AfG merchandise was sold as well as some lovely hand crafted jewelry and cards which were very kindly donated to us to raise funds for our cause. 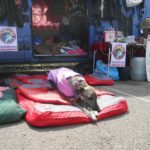 The group also hold regular awareness demonstrations outside their local Newcastle greyhound track at Brough Park. Where they display our thought provoking awareness banners and distribute our information leaflets. 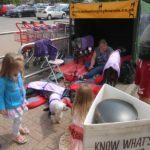 We had a beautiful day and a great space for our awareness station outside the store for our 2nd visit for this year. 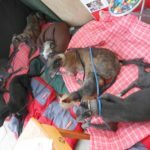 Our accompanying hounds were kept comfortable on their cozy beds and in the shade when need be with our specially designed shelter. 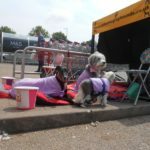 Also they were wearing their AfG Cool Houndz wet coats which not only keeps them cool all day but is a good way of promoting them so people can see how efficient they are. 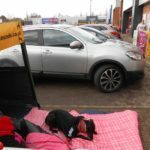 Being outside the store (weather permitting) not only allows us to have lots of space, but we are located between the pet store and M&S store next door so we not only meet people visiting the pet shop and M&S but also all the other shops on this busy industrial estate. On the Sunday we met some ladies who were part of the organizing team for the Celebration of Animals with Animal Blessing later that evening at the Norwich Cathedral, who invited us along to their event with our hounds and to have an AfG awareness table, so as the store closes at 4pm on Sunday we accepted this invitation to go along after packing away and having a short rest until 6pm. AfG were invited along to this event with an awareness table and as many of our rescued and foster hounds as we would like to bring. 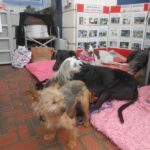 We met 2 of the event organizers earlier today whilst at our awareness day at Jollyes Pet Store Norwich. 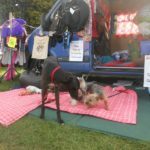 So as it was such a glorious weekend and after being able to have a rest with our hounds we set off to set up for this event. 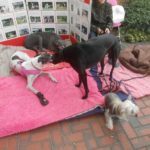 Earlier in the day we were able to get in touch with some of our supporters and adopters who were able to come along with their hounds. 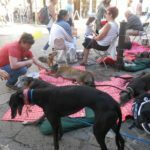 It was such a lovely setting and we were surrounded by all sorts of animals and other local animal welfare groups. All the animals were peaceful and well settled. 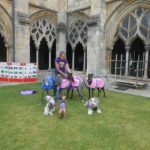 Other welfare organizations present were Dogs Trust, Guide Dogs for the Blind, Redwings Horse Sanctuary, Cats Protection Norwich and district, Eastern Counties Retired Greyhound Trust and the horses with the Norfolk Constabulary. 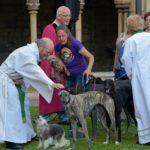 We had lots of time before the blessing at 7pm to meet the other charities with their animals and meet with the visiting public with so many coming over to meet our lovely hounds and show an interest in our work. 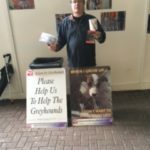 We were also able to issue awareness leaflets of our Greyhound Remembrance Weekend which was coming up in Norwich the following weekend. 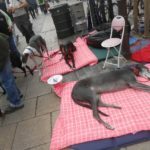 We also got a mention in a local newspaper in an article, not only of our presence at this evenings event but with information about our annual campaign event of the Greyhound Remembrance weekend for the following weekend. 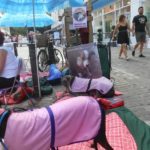 This weekend was the second of our two main campaign annual awareness events marking 90 years since commercial greyhound racing started in Britain on July 24th 1926, which is why we hold our ‘Greyhound Remembrance’ Weekend event every year over the nearest weekend to July 26th, to raise awareness of all the greyhounds who have been bred for, used by, suffered, died and ones who are unaccounted for, presumed killed in the name of greyhound racing. 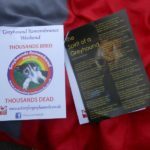 We issued almost 2,000 of our greyhound remembrance awareness leaflets produced especially for the weekend along with our leaflets ‘Spirit of the Greyhound’ a poignant poem (on the reverse is a list of some of the many hundreds of greyhounds who have lost their lives as a result of being injured whilst competing on the dangerously configured British greyhound tracks). We are still meeting people who are still unaware of these facts, so we are always encouraged that we are still being able to raise awareness to people who do not know. 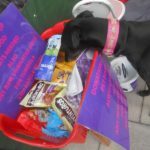 We have become well known over the past 17 years at our usual spot on Gentlemans Walk in Norwich for our awareness days with our street collections and being opposite the fantastic Lush store not only do we experience their amazing aromas throughout the day but they always have a stack of our leaflets to issue their customers, should any of them miss our presence. 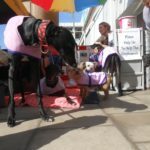 We were fortunate enough to have such glorious weather for the day, meaning our beautiful adopted greyhounds, along with some of our foster hounds were able to accompany us. 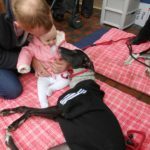 Because of this, we are able to allow to experience just how gentle and friendly greyhounds are in the hope more people may consider foster or adopting greyhounds, so in turn more will able to be saved. 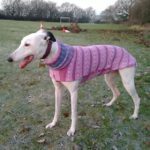 Today, our beautiful little foster greyhound Kiz, met a wonderful couple from Ipswich, who we hope will be her forever adopters. 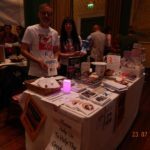 Rosemary organized this stall at Sheffield’s first ever vegan festival and was helped on the day by Jane and John. 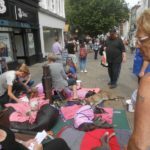 All three campaigners were kept busy interacting with the visiting public. 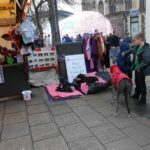 The stall raised lots of public interest and received lots of generous donations. 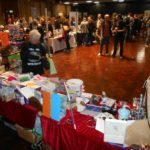 Hundreds of our information leaflets were issued and a lot of our various unique merchandise was sold. 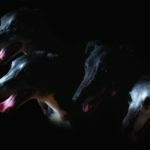 So this enables us to not only educate more people about our campaign and the plight of greyhounds, ones who are used, exploited and abused by the industry as well as the ones who are not wanted by them, but to raise vital funds to enable us to maintain our vital work. 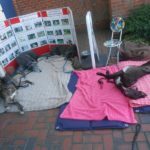 We took advantage of such wonderful weather this weekend to carry on raising awareness of our ‘Greyhound Remembrance’ Weekend by having a stall at one of our local car boot sales. 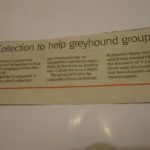 We carried on issuing our greyhound remembrance leaflets and poems along with our standard information leaflets. 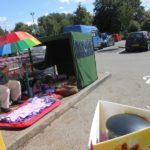 It is always a handy thing to know the lay outs of all the car boot sites, as it helps to know which way to park your vehicle to have access to as much shade as possible in hot weather or to be facing the sun on cooler days. 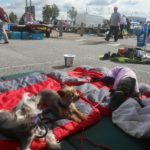 So our accompanying hounds are in the shade for best part of today as well as wearing their AfG wet coats. 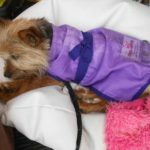 We managed to sell some of our wet coats, mats and neck bands today as we had samples on display as well as having some stock with us for sale, with the option of people also being able to purchase them from our website. 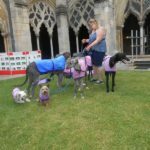 So not only do our hounds make people aware of what fantastic animals they are but also manage to promote how great our wet coats are once people see our hounds are the coolest around on such a hot day. 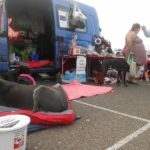 Another great weekend of awareness and fundraising for our second weekend this year at Pets at Home. 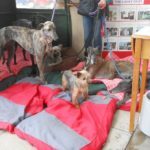 We were kept very busy all weekend with people constantly wanting to know the stories of our hounds who accompanied us as well as being interested in the work and campaigning we do. 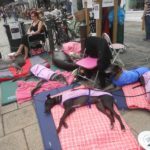 The management and staff at the store are so supportive, friendly and helpful and always allow us a great space outside their store to accommodate us with all our beautiful hounds as it is so important to keep them safe and comfortable. 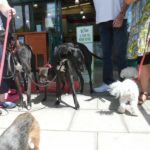 The hounds meet lots of other dogs but are always especially excited when other sighthounds come along. 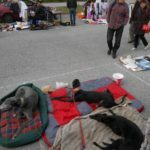 We often get donations of dog treats here so we have to be careful just how much our hounds have to eat during the day and we have to make sure they don’t pinch any of them when we are not paying attention. 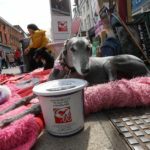 Notice greyhound Dove being sneaky around the treat donation basket!!. 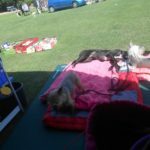 This is the first time we have had a weekend free which coincided with the Dogs Trust Annual Open Day at the Snetterton branch in Norfolk. Absolutely beautiful weather and a great space for our stall. 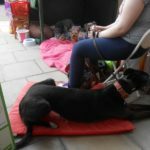 Hundreds of people visited the event and we met lots of people with rescued sighthounds and other breeds, some of who had been adopted from the Dogs Trust. 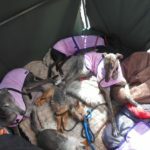 Our accompanying hounds were kept cool all day wearing our special Cool Houndz wet coats. 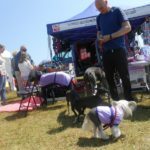 The coats, mats and neck bands were on display on our stall along with our other unique merchandise and because it was such a hot day the wet gear proved very popular which boosted our sales. Our other popular feature today was our cuddly toy tombola with all prizes being won by the end of the day. 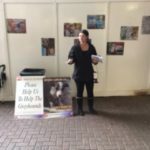 We received some very generous donations and were able to spread even more awareness with many visitors taking our campaign leaflets. A great stall today at the very popular busy local car boot sale. 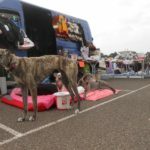 The car boot is on Sunday from April until October and is visited by hundreds of locals as well as holiday makers. 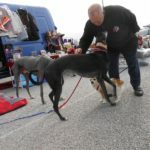 Many people make a special visit to our stall to see the beautiful hounds who accompany us. 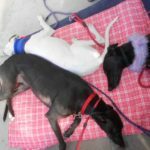 Often we will have a new foster dog with us who are awaiting their forever home, so not only do they receive lots of attention and get well socialised with people and other dogs but there is often a chance they may be met by a future adopter. 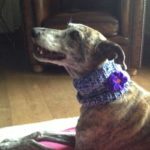 Little brindle foster greyhound Kiz was with us today, she has been in the care of Afg for just a short while after coming over to us from Ireland with her brother Vince and she really enjoyed herself. 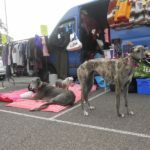 We often have peoples children stay on the stall fussing the hounds instead of walking around the sale with their parents. 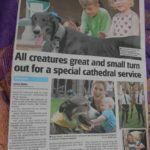 We had a piece in our local newspaper prior to today’s event, which of course was held in conjunction with ‘ Remember Rusty’ weekend, which AfG continue as one of our main awareness events each year to remember not only a greyhound who was used, abused, tortured and killed in the name of greyhound racing, but for the thousands who go unaccounted for, many who may have met the same grim end as poor Rusty did. 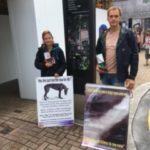 We issued hundreds of leaflets today in the hope of making even more people aware of the atrocities of the greyhound racing industry and hopefully encouraging many more people not to support it. 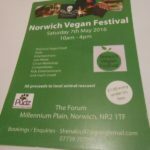 We also advertised the upcoming Norwich Vegan Festival which AfG were having a stall at the following Saturday. 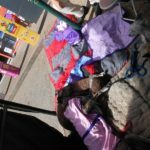 This was the first all vegan festival for Norwich orgainised by Shena Lou from Pudz animal sanctuary. Although all the stalls apart from the amazing food stalls were indoors, the weather was like a Summer day outside. 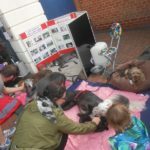 Thousands of public visited this amazing event so we were kept very busy all day. 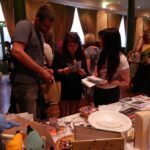 Our tombola sold out by mid day and our merchandise was very popular. 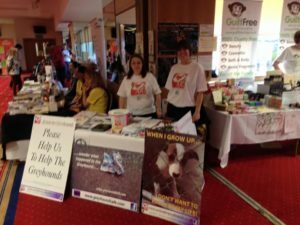 It was so nice to spend the day with so many like minded people with other stall holders all doing their bit for campaigning for animals and meeting so many interesting and compassionate visitors to the event. 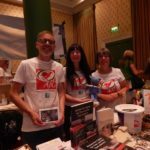 So many people were supportive of our campaign so we were able to raise even more awareness of our work. Well done to Shena and her helpers for putting in so much hard work and organising such a great event. Another lovely morning for us at this very popular car boot sale off A140 near Norwich. Open all year round (apart from Christmas and New Year weekends) and being a park and ride site means lovely and clean on hard standing ground. 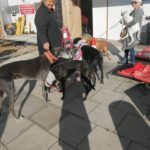 We always meet really nice people and dogs here and as always our hounds who accompany us always receive lots of attention and admiration. This is our first visit to Norwich Jollyes and the first of our three weekends booked here for 2016. 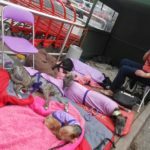 We were lucky enough to have a great space outside the store to accommodate our hounds and awareness station and met lots of new people as well as people who already know of AfG. 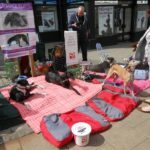 We received many generous money donations as well as pet food and treats and the hounds, as usual received lots of attention. 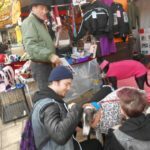 We met a lot of people who have rescued dogs and other animals which is very encouraging to learn that so many people are choosing to adopt animals rather than buy them from breeders. Thanks go to the friendly store managers and staff for their great support.